Well, I completely blew off posting my workouts this week but I did do a good amount of work. Monday became a hill repeat day because I was going to be biking on Wednesday. So Lisa and I did hill repeats at Umstead, getting in 5 repeats. It felt painful as always and my Garmin was AWOL so I just tried to keep up with her. Our times were not signficantly different than what I've posted before. 105 lbs 6 reps (!!!) Felt good and I had some left in the tank. Tuesday post-work, I led the beginner group which consisted of me and one woman! Susan was pretty entertaining though and we had some excitment on our ride when she ran over a copperhead! And then I kind of stupidly curved my bike around the copperhead. Other than that it was pretty uneventful. It was a mellow ride. 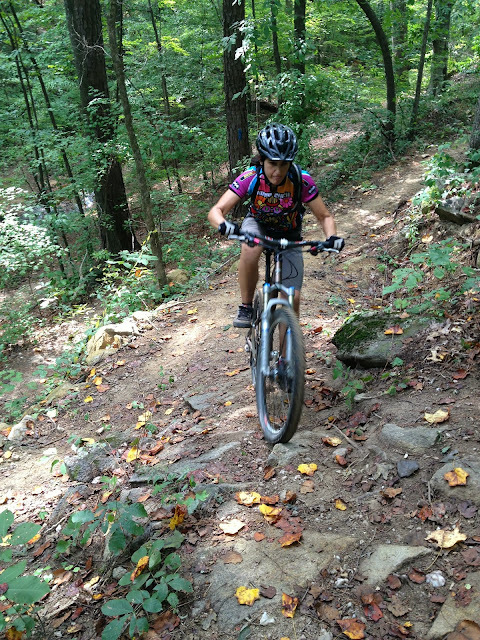 Wednesday was even more biking at Lake Crabtree. I actually decided to go with the coed Intermediate group which manages to go at quite a fast pace, much faster than I am accustomed to but I kept up and got to see 3 guys crash fantastically because they didn't know how to go that fast and stay in control. It hurt my eyes to watch them swing their legs out from the bike as they went around a turn. None got really hurt in their crashes but I just didn't get the kind of ego it takes to keep trying to keep up at a crazy pace you aren't ready for. The second part of the ride, I just took it easy with one girl and we finished a lap before it was time for night riding. I got out my helmet lamp and my handlebar lamp and sweeped for the "slower" group. It was pretty fun and I felt more confident mountain biking at night than I did last year. Another night ride this coming Wednesday! I tried 95 lbs 2 more times but didn't make it so I put it away. This is a hard lift for me and I have to be happy with the progress I'm making since 95 lbs used to terrify me- I felt like I wouldn't be able to catch the weight! But I can now and it's awesome. This means one person runs 400M while the other has to hold a plank until they come back and then the second person runs. 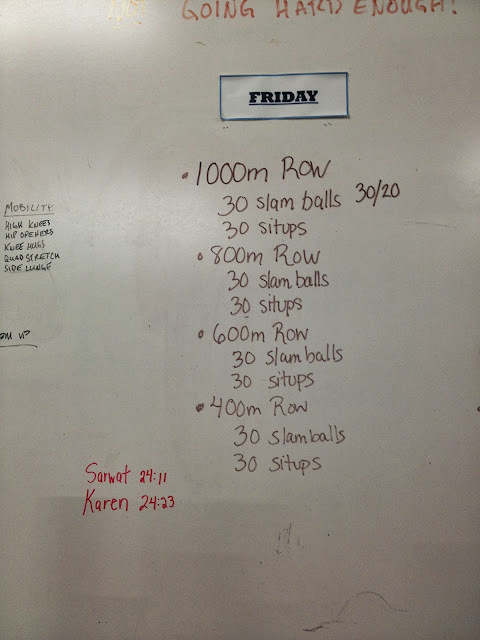 It was tough doing the wall sits while Karen ran. The planks were all right. The funny thing is that I was way more motivated to finish my 400M runs faster because I knew Karen was suffering the plank or wall sit! I tried really hard to row better and use my legs but it was tough. 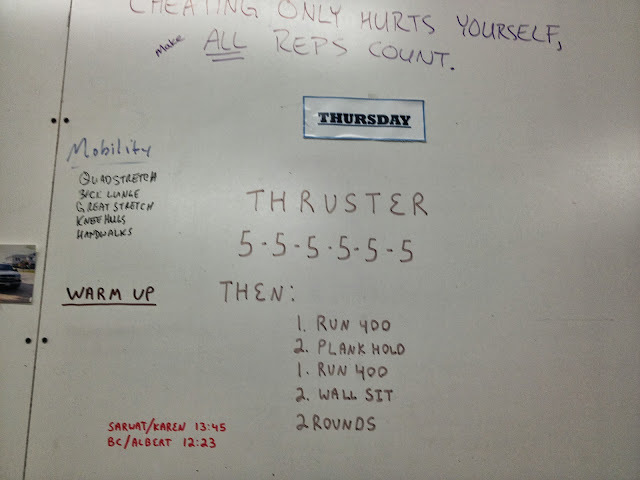 I don't think I caught my breath during this WOD and my legs felt it for two days after. Saturday was an easy bike ride at San Lee Park. It was a very small girls ride - just me and Angie. Angie discovered that just riding Crabtree doesn't do much for climbing and technical skills but she loved it out there. We did all the rock gardens and I manged to get up the Lizard Lick rock "wall" climb. I had to make 3 attempts but I was determined. Overall, we did 11 miles and that was my Saturday! Sunday was supposed to be a long run but all I had in me was 11 miles. I picked up the pace in the second half and finished strong. Now I just need to run just a little bit more in the next couple of weeks. I wasn't planning on doing anything else but I got an offer for a bike ride so I ended up biking 18 miles in Umstead in the afternoon. I think the combination plus getting up early for the morning (started at 7 AM!) made me tired and I fell asleep around 7:00 pm and woke up at 8:30 pm just so I could eat some food. It was a good week, I'm hoping next week is the same or better! Phew, just reading all that tired me out! Here's to a better week, hopefully. Hope to see you sometime this week!